The Persian Gulf is located in Southwest Asia. It is an extension of the Indian Ocean located between Iran and the Arabian Peninsula. Historically and commonly known as the Persian Gulf, this body of water is sometimes controversially referred to as the Arabian Gulf by certain Arab countries or simply The Gulf, although neither of the latter two terms is recognized internationally. The Persian Gulf and its coastal areas are the world's largest single source of crude oil, and related industries dominate the region. Because of its natural resources, access to the Persian Gulf has become the focus of international tension, such as the 1980-1988 Iraq-Iran War, in which each side attacked the other's oil tankers. During Operation Desert Storm in 1991, the gulf gave its name to the United States-led ejection of Iraqi forces from Kuwait, called the Persian Gulf War, or the Gulf War even though most of the action took place on land. The Persian Gulf is rich with abundant fishing grounds, extensive coral reefs, and abundant pearl oysters, but its ecology has come under pressure from industrialization and construction. 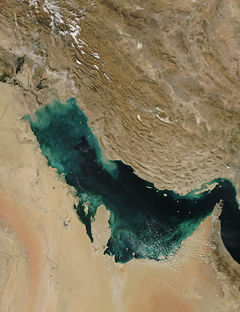 This inland sea of some 251,000 km² is connected to the Gulf of Oman in the east by the Strait of Hormuz. Its western end is marked by the major river delta of the Shatt al-Arab, which carries the waters of the Euphrates and Tigris rivers. Its length is 989 kilometers, with Iran occupying most of the northern coast and Saudi Arabia most of the southern coast. The gulf is about 56 kilometers wide at its narrowest, in the Strait of Hormuz. The waters are overall very shallow, with a maximum depth of 90 meters and an average depth of 50 meters. 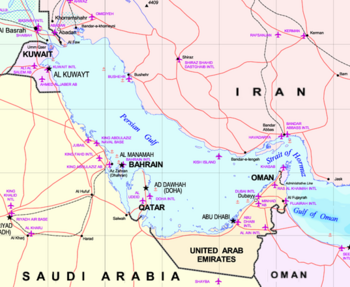 Countries with a coastline on the Persian Gulf are (clockwise, from the north): Iran, Oman (exclave of Musandam), United Arab Emirates, Saudi Arabia, Qatar on a peninsula off the Saudi coast, Bahrain on an island, Kuwait, and Iraq in the northwest. Various small islands lie within the Persian Gulf, some of which are subject to territorial disputes by the states of the region. The Persian Gulf and its coastal areas are the world's largest single source of crude oil, and related industries dominate the region. Al-Safaniya, the world's largest offshore oilfield, is located in the Persian Gulf. Large natural gas finds have also been made, with Qatar and Iran sharing a giant field across the territorial median line (North Field in the Qatari sector; South Pars Field in the Iranian sector). Using this gas, Qatar has built up a substantial liquified natural gas (LNG) and petrochemical industry. The oil-rich countries (excluding Iraq) that have a coastline on the Persian Gulf are referred to as the Persian Gulf States. Iraq's egress to the gulf is narrow and easily blockaded, consisting of the marshy river delta of the Shatt al-Arab, which carries the waters of the Euphrates and Tigris Rivers, where the left (east) bank is held by Iran. Map of the Persian Gulf. The Gulf of Oman leads to the Arabian Sea. In 330 B.C.E., the Achaemenid Empire established the first Persian Empire in Pars (Persis, or modern Fars) in the southwestern region of the Iranian plateau. Consequently in the Greek sources, the body of water that bordered this province came to be known as the Persian Gulf. No water channel has been so significant as Persian Gulf to the geologists, archaeologists, geographers, merchants, politicians, excursionists, and scholars whether in past or in present. This water channel which separates the Iran Plateau from the Arabia Plate, has enjoyed an Iranian Identity since at least 2200 years ago. No written document remains from the era before the Persian Empire, but in their oral history and culture, the Iranians have called the southern waters "Jam Sea," "Iran Sea," or "Pars Sea." During the years 550 to 330 B.C.E., coinciding with the sovereignty of the first Persian Empire in the Middle East, the name "Pars Sea" was widely written in the compiled texts when referring to the whole part of the Persian Gulf and some parts of the Arabian Peninsula. A historical map of the Persian Gulf in a Dubai museum, United Arab Emirates with the word Persian removed. In the travel account of Pythagoras (c. 570 B.C.E.–496 B.C.E. ), several chapters are related to a description of his travels, accompanied by Darius the Great, to Susa and Persepolis, and the area is described. From among the writings of others in the same period, there is an inscription and engraving of Darius the Great in which he named the Persian Gulf water channel Pars Sea. With the rise of Arab nationalism (Pan-Arabism) in the 1960s, some Arab states of the region started adopting the term "Arabian Gulf" to refer to the waterway. However, this usage has not found much acceptance outside the Arab world and is not recognized by the United Nations or any other international organization. The United Nations Secretariat on many occasions has requested that only "Persian Gulf" be used as the official and standard geographical designation for the body of water. At the same time, the historical veracity of the usage of "Persian Gulf" can be established from the works of many medieval historians. The Persian Gulf today has an average depth of only 35-50m. During the most recent glaciation, which ended 12,000 years ago, worldwide sea levels dropped 120 to 130m, leaving the bed of the Persian Gulf well above sea level during the glacial maximum. It had to have been a swampy freshwater floodplain. The drainage of the combined glacial-era Tigris-Euphrates made its way down the marshes of this proto-Shatt-al-Arab to the Strait of Hormuz and into the Arabian Sea. Reports of the exploration ship Meteor have confirmed that the Gulf was an entirely dry basin about 15,000 B.C.E. Close to the steeper Iranian side a deep channel apparently marks the course of the ancient extended Shatt al-Arab, called the "Ur-Schatt." A continuous shallow shelf across the top (north) of the Gulf and down the west side (at 20m) suggests that this section was the last to be inundated. At the Straits of Hormuz, the bathymetric profile indicates a division into two main channels that continue across the Bieban Shelf before dropping to a depth of about 400m in the Gulf of Oman; the deeper parts of these channels may be due to delta deposits at the edge of the deep ocean collapsing in a succession of big underwater landslides, causing underwater erosion by the resulting turbidity currents. In addition to large-scale flooding of the Persian Gulf there is confirmed evidence of relatively recent extended local flooding in this part of the world. Excavations in Iraq, for example, have shown evidence of a flood at Shuruppak around 2900-2750 B.C.E. that extended nearly as far as the city of Kish (whose king, Etana, supposedly founded the first Sumerian dynasty after the Deluge). Sir C. Leonard Woolley’s excavations at Ur south of Uruk in the 1920s found a more than 2.5m thick homogeneous silty loam stratum that was void of artifacts, which Woolley in 1931 ascribed to Noah’s Flood. For most of the history of human settlement in the Persian Gulf the southern side was ruled by nomadic tribes. At the end of the fourth millennium B.C.E. the southern part of the Persian Gulf was dominated by the Dilmun civilization. In a 1981 Journal of Cuneiform Studies article, "The Tangible Evidence for the Earliest Dilmun," Theresa Howard-Carter espoused her theory identifying Dilmun with Qurna, an island at the Strait of Hormuz. Her scenario put the original mouths of the Tigris-Euphrates rivers, which she thought should be the site of the primeval Dilmun, at or even beyond the Straits of Hormuz. For a long time the most important settlement on the southern coast was Gerrha. In the second century the Lakhum tribe, who lived in Yemen, migrated north and founded the Lakhmid Kingdom along the southern coast. During the seventh century, the Sassanid Empire conquered the whole Persian Gulf region. Between 625 B.C.E. and 226 C.E. the northern side was dominated by the Median, Achaemenid, Seleucid and Parthian Empires. After the fall of the Parthian Empire, the Sassanid Empire ruled the northern half and at times the southern half of the Persian Gulf. The Persian Gulf, along with the Silk Road, was very important to trade in the Sassanid Empire. Siraf was an ancient Sassanid port that was located on the north shore of the Persian Gulf in what is now the Iranian province of Bushehr. Portuguese expansion into the Indian Ocean in the early 16th century, following Vasco da Gama's voyages of exploration, saw them battle the Ottomans up the coast of the Persian Gulf. In 1521, a Portuguese force invaded Bahrain to take control of the wealth created by its pearl industry. In 1602, Shāh ‘Abbās expelled the Portuguese from Bahrain. With the support of the British fleet, in 1622 'Abbās took the island of Hormuz from the Portuguese; much of the trade was diverted to the town of Bandar 'Abbās, which he had taken from the Portuguese in 1615 and had named after himself. The Persian Gulf was therefore opened to a flourishing commerce with Portuguese, Dutch, French, Spanish, and British merchants, who were granted particular privileges. From 1763 until 1971, the British Empire maintained varying degrees of political control over some Persian Gulf states, including the United Arab Emirates and at various times Bahrain, Kuwait, Oman, and Qatar. The United Kingdom maintains a high profile in the region; in 2006, over one million Britons visited Dubai alone. Mangroves in the Persian Gulf are nurseries for crabs, small fish and insects, as well as the birds that eat them. Hundreds of thousands of birds stop in Arabian mangroves while migrating between Africa and Asia. But the mangroves and other critical wildlife habitats such as sea grasses, beaches, and coral reefs are threatened by the construction boom in Oman and Dubai. Oman's beaches are some of the world's most important nesting grounds for the green and loggerhead sea turtles. "These are some of the world's great nesting areas. If you start taking their habitat and food resources, it can affect not just individual birds but the entire population," said David Aubrey, chief executive of the Woods Hole Group, a U.S. environmental survey firm working in Saudi Arabia. "It takes a high level of diligence and planning to retain mangroves, and those aren't features you associate with the rapid development along the UAE coast." ↑ United Nations, April 4, 2006, Historical, Geographical and Legal Validity of the Name: Persian Gulf. Retrieved January 8, 2009. ↑ Jim Krane, July 3, 2006, Development in Persian Gulf Threatens Wildlife, Discovery Communications. Retrieved January 8, 2009. Cottrell, Alvin J. 1980. The Persian Gulf States: A General Survey. Baltimore: Johns Hopkins University Press. ISBN 9780801822049. Metz, Helen Chapin. 1994. Persian Gulf States: Country Studies. Washington, DC: Federal Research Division, Library of Congress. ISBN 9780844407937. The Persian Gulf. Homepage. Retrieved January 8, 2009. United Nations. April 4, 2006. Historical, Geographical and Legal Validity of the Name: Persian Gulf. Retrieved January 8, 2009. Yetiv, Steven A. 1997. The Persian Gulf Crisis. Westport, CT: Greenwood Press. ISBN 9780313299438. Iranian Studies Group at MIT. Factsheet on the Legal and Historical Usage of the "Persian Gulf"
This page was last modified on 9 February 2019, at 23:41.